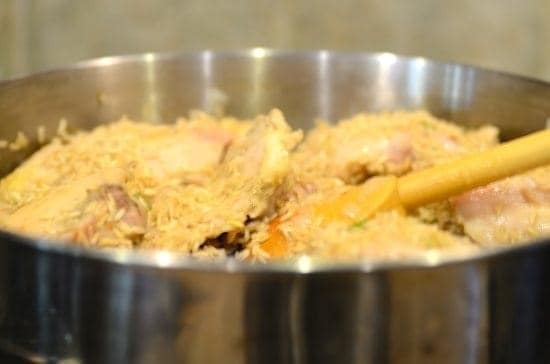 Galinhada (pronounced gah-leen-YA-dah) is a rice made with chicken, saffron, and vegetables, which is a typical Brazilian dish from both the states of Minas Gerais and Goiás. However, in Goiás guariroba (a sour heart of palm) and pequi (a fruit with a strong taste, native to the Brazilian savanna or cerrado) are added to the dish, distinguishing it from that of Minas Gerais. ** These ingredients are not part of the traditional recipe. Season the chicken thighs with salt, pepper, garlic powder, and cumin. Let rest for about 30 minutes. Meanwhile, dice and chop the vegetables. Reserve. In a large pan over medium-high heat, sauté the onion and bell pepper for about 2 minutes. Add the chicken and let brown for about 2 minutes each side. Add the garlic and sauté for 30 to 60 seconds. Add the rice and brown quickly. Add the wine and let evaporate. Then, add the broth. Dissolve the saffron in the warm water and add to the pan with the tomato paste and bay leaf. Stir, bring to a boil, reduce heat to medium-low, and cover the pan. Let cook for about 15 to 20 minutes, or until the rice is cooked and all the liquid has completely evaporated. Adjust the salt, if necessary. Remove from the stove, add the lemon juice, the tomato, cooked peas, and the green onions. Mix gently. Serve galinhada with a good chardonnay wine. Enjoy! Thanks for the response. I tried it two nights ago but had to resort to using regular rice. I have a newborn and toddler at home so I had to use what I had in my pantry. I just pulled the chicken out and added it later after the rice has cooked a bit. I’ll have to try it again with the parboiled rice. Thanks. Hi, Ryan! This is an easy-to-cook dish. Don’t worry about it. 🙂 If your wife’s family is not a big fan of peas (like my husband), I advice you to add only 1 cup of cooked peas to this dish instead of 12 oz. You can also adjust the amount of salt. Since my husband has high blood pressure, I cook with less salt than the usual amount. Serve it with a fresh salad and a good chardonnay. Good luck and thanks for stopping by. If you have any questions, please contact me. I’d be glad to help you. I have some leftover saffron rice in the frig that needs used. I now know what’s for dinner! Thanks for sharing. 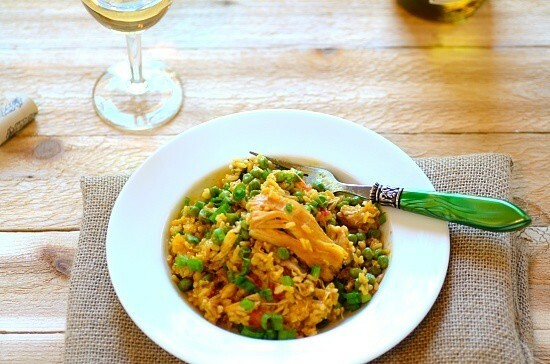 I hope you enjoy my Brazilian saffron rice w/ chicken recipe…Thanks for stopping by and have a great dinner!!! Just tried pequi fruit for the first time at Silva’s; I am still looking for a way to describe it. Lily liked but my youngest different. What is this most closely related to? Welcome to FBTY, Calvin! Unfortunately, I do not know any other fruit similar/related to pequi. In the US, its pulp is commercialized as a preserve under the brand Cerrado Goiano . It is very popular in Midwest Brazil (region). 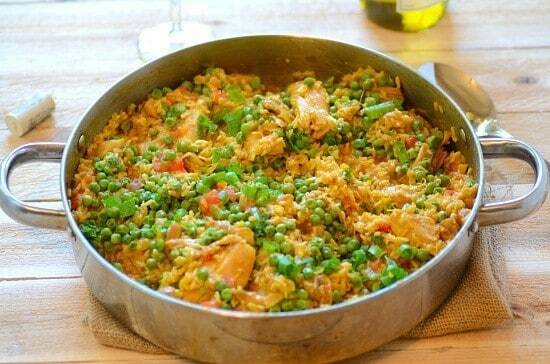 There are famous dishes made with it such as chicken with pequi and also rice with pequi. Although my galinhada recipe does not take pequi because it is a typical dish from Minas gerais, you can adapt the recipe and make a galinhada goiana with pequi. Skip the saffron and peas, and use pequi pulp. Wishing you a great day! Olá, Denise, adoro galinhada e preparo em casa meu “arroz de braga”, muito parecido tb. Te convido a preparar esse meu! 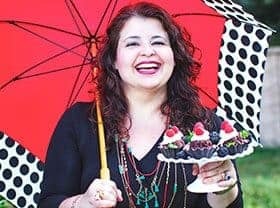 Parabéns pelo seu blog. Gostaria de saber qual equipamento você usa para fotografar suas delícias! A qualidade esta perfeita. Olá, Deborah! Bem-vinda a FBTY! Eu uso uma camera profissional a Nikon D7000 com lentes Macro. Fico feliz em saber que você gosta da qualidade das minhas fotos. Um bom fim de semana pra você e sua família! Hi, Page!!! Yes, you can use turmeric instead. Just go easy with it. Of course, the color will be similar but the taste won’t be quite the same. Enjoy!